On Tuesday, May 8, the Congressional Black Caucus will be hosting a Twitter town hall focused on community policing and police accountability, during which members will be responding to questions and comments from constituents, celebrities, activists and advocates alike. In the wake of the recent police shootings of Diante Yarber, Saheed Vassell and Stephon Clark—shooting deaths that, at least at the outset, appear to be sanctioned by the state—people are looking for answers and solutions to the pervasive problem of police violence against black people. This is a good opportunity to voice your concerns and have them heard. CBC Chairman Cedric Richmond (D-La.) and other members of the caucus will take over the CBC’s official Twitter account for a full eight hours May 8, beginning at 9 a.m. and ending at 5 p.m. ET. 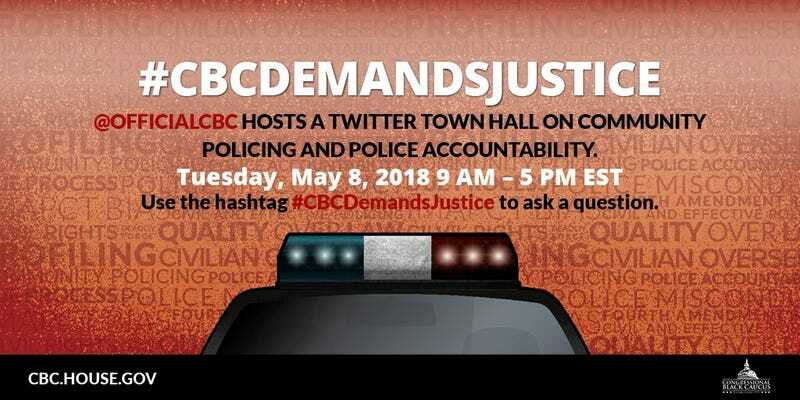 To ask a question or make a comment, simply use the hashtag #CBCDemandsJustice or @ the CBC’s Twitter account. What kind of federal legislation can be put in place to ensure police are held accountable @OfficialCBC? Tweeting in any of those formats will make sure your tweet is seen, but using the hashtag in all tweets relevant to the town hall is best. So be sure to take part in the town hall on Tuesday, May 8, from 9 a.m. to 5 p.m. ET.